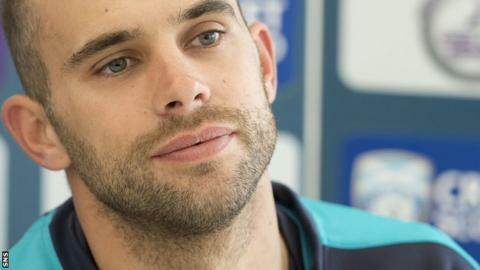 Captain Kyle Coetzer hopes Scotland can prey on England's uncertainties in Friday's one-day international. Coetzer says England had a "disappointing winter" and hopes their poor run of form continues. Meanwhile, acting coach Craig Wright feels he is armed with tactical insight from former colleague Paul Collingwood. Asked if England's 2010 World Twenty20-winning captain had given him an inside track on the opposition, Wright replied: "He has." "I can't possibly tell you what it is," Wright added. "We played an A team game down at Durham last week, and he had us round for a barbecue so we were talking tactics." England have travelled to Scotland with Alastair Cook still captain of a largely familiar squad, but with Peter Moores back in the head coach role he vacated five years ago. "England maybe didn't have the winter they would have liked [in their Ashes series whitewash in Australia]," said the Aberdeen-born batsman. "I guess from our point of view we'd like to put a bit of pressure on them." "I can imagine there are a few players trying to prove themselves," said Coetzer. "No-one's position is cemented yet, so I think some of them may be feeling a little bit of pressure to have to perform in this game. "We're meant to be the underdogs, so we can maybe prey on all that a little bit. "A good start to the game [for us] could really bring back some haunting memories for them." New head coach Grant Bradburn will take up his role on 1 July, replacing Pete Steindl who left in December after failing to reach the World Twenty20. He will be assisted by Wright, who took over alongside former England batsman Paul Collingwood on an interim basis for the successful World Cup qualification campaign. "I'm immensely looking forward to it," said acting coach Wright. "It's a great honour to be captaining my country, especially here in Aberdeen. "I suppose Ireland and the Netherlands do have one up on us at the moment, having taken a couple of scalps. "But this is our time to prove ourselves."